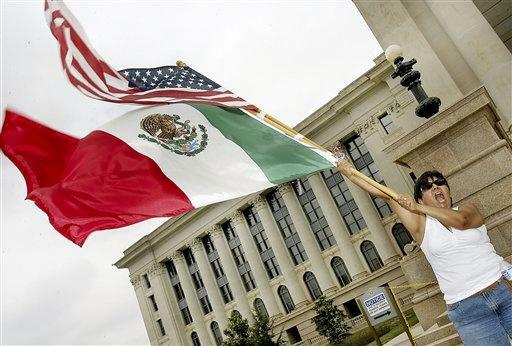 Hispanics Now Outnumber Native Americans In Okla.
OKLAHOMA CITY (AP) - A state that has been considered the heart of the nation's Indian Country since the Trail of Tears nearly two centuries ago now has more residents who identify themselves as Hispanic than Native American, according to figures released Tuesday by the U.S. Census Bureau. While Oklahoma is likely to maintain the nation's largest per capita population of Native Americans, their numbers are not growing nearly as rapidly as the booming Hispanic population. Over the past decade, the number of Hispanics has nearly doubled from 179,304 in 2000 to 332,007 in 2010. Hispanics now account for 9 percent of the state's 3.75 million residents, compared to 8.5 percent for Native Americans. "I suspect that Native Americans took a little bit of pride in being the largest minority population," said state Rep. Paul Wesselhoft, a member of the Citizen Potawatomi tribe. "Now it's the Hispanic population that can now take that pride." Oklahoma's history has been linked to Native Americans decades before it gained statehood in 1907. It is home to dozens of sovereign tribes, many forced from their homes along the Trail of Tears in the 1830s. It's also the birthplace of iconic cowboy and humorist Will Rogers, a member of a prominent Cherokee Nation family who was born in Indian Territory that later became the state. While the 85 percent population spike has allowed Hispanics to become the state's largest minority, the population of people identifying themselves solely as Native Americans increased from 273,230 in 2000 (7.9 percent of all Oklahoma residents) to 321,687 (8.5 percent) in 2010. When all combinations of mixed-race people are included, over 12 percent of Oklahomans claim some level of Indian ancestry. Former Oklahoma House Speaker Larry Adair, chairman of the Cherokee Nation Gaming Commission, said it proves the state continues to be a "melting pot." Still, he said he was surprised Hispanics had moved past Native Americans in population. Keith Gaddie, a professor of political science at the University of Oklahoma, said the figures show some public policy efforts to curtail illegal immigration may not be having an impact on Hispanic immigration. House Bill 1804, an anti-illegal immigration bill enacted in 2007, makes it illegal to knowingly transport illegal immigrants, creates state barriers to hiring illegal immigrants and requires proof of citizenship before one can get certain government benefits. The law is being challenged in federal court. "For folks who thought HB 1804 would lead to an exodus of Hispanics from the state of Oklahoma, that doesn't appear to have happened," Gaddie said. In the far western Oklahoma Panhandle, Hispanics drawn to the region by swine farms and other concentrated animal feeding operations comprise 36 percent of the population, according to the census figures. More than 17 percent of the 580,000 residents of Oklahoma City, the state's largest city, now identify themselves as being of Hispanic descent while in Tulsa, the state's second largest city, 14 percent of its 392,000 residents say they are Hispanic. Lawton and Enid also recorded significant concentrations of Hispanic residents. State lawmakers said the substantial increase in Hispanic residents, especially in south Oklahoma City, make it more likely than ever that they will be able draw new legislative voting districts with Hispanic majorities although proponents of anti-illegal immigration legislation may voice opposition. "There will be, I'm sure, some," said Rep. Dale DeWitt, R-Braman, chairman of the Oklahoma's House's Redistricting Committee. "But at the end of the day, we'll do this thing as fair as we possibly can. If we don't do it fair, the thing will end up in court." State lawmakers attempted to draw a majority Hispanic House district on Oklahoma City's south side following the 2000 census, Adair said. But former Rep. Bill Paulk, a Democrat who headed the legislative redistricting committee under Adair, said the Hispanic population was too dispersed to form the core of a legislative district. He said lawmakers would have been forced to resort to gerrymandering to create a Hispanic majority district. "It would have looked like a piece of string to make it work," Paulk said. Associated Press Writer Rochelle Hines contributed to this report.